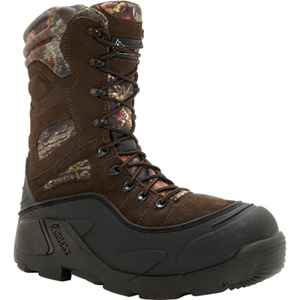 The Rocky BlizzardStalker Pro Waterproof Insulated Black Boot (5452) was designed for the outdoorsman working in extreme cold (sub-zero temperature) weather. These boots will keep your feet warm with 1200grams of Thinsulate insulation and they are completely waterproof. The 5452 has a rugged outsole that will provide excellent grip on icy and wet surfaces. This boot is built to last and will help your survive through some of the harshest cold weather environments on the planet.